Walking up a flight of stairs into this restaurant is like stepping into the forgotten world of ancient China. With its high ceilings, wooden panels and rows of tea themed ornaments, this is a recluse from the hustle and bustle of the main street outside. Located in Newtown, the restaurant’s name is inspired from the name of the person, Luyu, who wrote the first definitive work on cultivating, making and drinking tea, coupled with “Yum Yum” which refers to the dumplings, and this inspiration of the partnership of tea and dumpling is seen throughout the menu. We visited this restaurant on a Sunday night without making a booking, and the staff was friendly and was accommodating for our large table with adults and kids. This entree consists of pancakes wrapped with duck, spring onion and cucumber. The pancake was a bit dry, but the duck was very tasty and had the right balance of fat. The flour dough in these dumplings are baked with king oyster mushroom, Chinese mushroom, fungi, carrot and coriander inside. When served, they looked like mini hedgehogs complete with spikes and eyes. The pastry was sweet and soft, but the filling inside, being predominately mushrooms, was a bit bland. These dumplings needed some dipping sauce to bring out their flavours. The rice dough in these dumplings are steamed with prawn, carrot, coriander and celery inside, and some caviar is sprinkled on top of these dumplings. Visually, they looked stunning, as they were in the shape of money bags, with the caviar on top looking like coins. In fact, they looked alot like the money bags from the computer game “The Legend of Zelda”. Taste-wise, these dumplings were nicely cooked and elegant, with the flavours of the prawns and caviar melding well together. This steamer consists of the Herb Dumping, Fungi Dumpling and Starburst Dumpling. The Herb Dumpling is made from steamed rice dough filled with prawns and chives. This dumpling was nicely done with a good ratio of prawns to chives, so the freshness of the prawns shone through. The Fungi Dumpling is made from steamed rice dough with king oyster mushroom, Chinese mushroom, fungi, carrot, coriander and celery inside. The texture of this dumpling was interesting, where in one mouthful, there were elements of softness, crunchiness and chewiness. However, similar to the Manga Dumpling Hedgehog, the taste was a bit bland, which again required some dipping sauce to bring out their flavours. The Starburst Dumpling is a modern take on the traditional Xiao Long Bao, replacing the pork filling with chicken filling. The steamed flour dough is infused with fruit, with the filling being chicken and homemade soup. Visually, this dumpling was impressive. It literally looked like a large starburst, with different colours illuminating its wrapping. One bite, and the soup inside bursted into our mouths, creating a wonderful sensation, and this was balanced by the subtle fruity flavours of the wrapping. This is a must try for anyone coming to this restaurant. This consists of chicken, ginger, shallots and Chinese cabbage in seaweed flour dough which was pan-seared. This dumpling was very tasty, with a nice ginger flavour. This dumping is made from pan seared flour dough with chicken, prawn, ginger, shallot and truffle inside, served on skewers. It is a modern take on the Siu Mai being sold on the streets of China, replacing pork with chicken and adding a touch of luxury with the truffle. This was a very nice dumpling. The truffle flavours was fused perfectly with the subtle flavours from the ginger and shallot. Another must try dish. This consists of fried squid with spring onion, garlic and serrano chilli. A fairly average dish with the texture of the squid more on the limpy side, but the serrano chilli provided a nice kick to this dish. This dish is an orange roughy fillet steamed in shallot and ginger. The taste was spot-on, but the fish was a bit overcooked. The sauce was really tasty and if we had some steamed rice, we would have mixed the sauce with the rice and gobbled it down. This consists of chicken, beetroot, serana chilli and honey coated walnut. A modern take on the chicken stir-fry, the flavours were nicely balanced, with the spiciness of the chilli balanced by the sweetness of beetroot, while the walnut provided the crunch which contrasted with the softness of the chicken flesh. This fried rice contains duck, egg, asparagus, shallot, coriander, baby corn and mustard seeds. It has great mouth-feel when we took a bite, with a variety of textures cumulating in our mouths. However, the flavours from the asparagus and shallot were too overpowering, and we were not able to taste the other elements in this dish. Overall, Luyu & Yum Yum is the place to be for tea and dumplings as their name implies. However, their other dishes need to catch up to the high standards they have set with their dumplings. This new burger joint has just been opened in Newtown, and each day, a long line of people awaits to try one of their infamous burgers. Social media has hyped up this place, with a recent article in Good Food suggesting that this may be the best burger place in Sydney, comparing it with the legendary American fast-food chain, Shake Shack. However, reviews have since been mixed about this place, so we decided to brave the queues and try it out for ourselves. Walking into the store at 5.15pm on a rainy Saturday night, there was already a long queue inside the store. The store is very small, and can accommodate around 25 people. It has a simple layout, with lots of small tables, and an open kitchen where you can see the workers at work. The first impression we have of this place was the aroma coming from the open kitchen, with the smell of beef cooking on the open grill making us hungry as we waited in anticipation for our food. The menu here is very simple, with a choice of Cheeseburger ($10), Bacon Cheeseburger ($12), Double Cheeseburger ($15) and a Vege Burger ($11). Fries were also available for $5. Unlike some other reviews we have read, there was no choice for us to add onions, so we presume their menu has changed. Drinks offered at this place were termed “Sodas” and is $3 for a small cup and $4 for a large cup. When asked further what sodas were available, we were told that the sodas were basically standard soft drinks, so we did not order any. This was different to what we have read in other reviews, which suggested that they were offering their own sodas with 30% to 50% less sugar than standard soft drinks. We also could not see any shakes on the menu, which we understood was offered on the menu previously. We ordered a Double Cheeseburger, Bacon CheeseBurger and a serving of Fries. They were ready for collection, in a small metal tray, after around 15 minutes wait. The Fries were crinkle cut, which gave them some nice texture. They were well seasoned, and were crispy and crunchy. The appearance of the burgers was quite rustic, and no attempt has been made to make them look more glamourous. The size of the burgers were quite small. The buns of the burgers were soft, yet firm enough to absorb all the sauces and juices from the filling. This may be due to the addition of a special ingredient in creating buns, which we understood to be mashed potatoes. The patties were made with beef mince from Vic’s Meat, with a meat to fat ratio of about 80:20. The result was a very flavoursome beef patty, with the beef being cooked to perfection. The cheese just melted in our mouths, and the special sauce that was used in the burger had a tangy savoury flavour which lifted the burgers to another level. The soft buns, combined with the rich beef patties and gooey cheese, literally melted in our mouths. The burgers were really well made. The Double Cheeseburger, with its double beef patties, had a much more richer beef flavour, compared to the other burger we tried. The Bacon Cheeseburger included an additional piece of bacon, and the smokey flavour of the bacon complimented well with the flavours of the beef patty. Overall, as a fast food burger joint, Jack’s Newtown really satisfies. The burgers, although a bit small, are rich in flavour, and is a place to be if you are in the area and want a quick no-fuss burger fix. 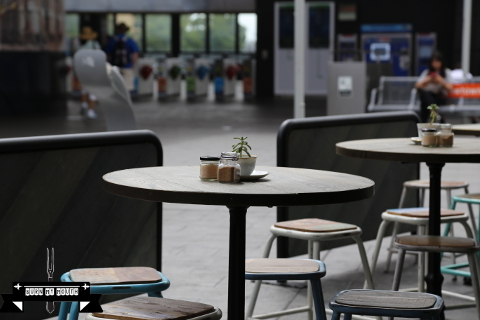 Located at Newtown station, this small café is like an oasis away from the hustle and bustle of the business of King Street beneath. 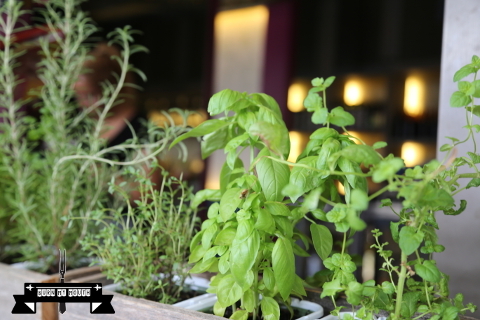 The small herb pots outside the café, with its friendly staff inside, is the ideal place to chill and relax when you want to be away from the crowds on the main road. We have been to this café a few times, and below are some highlights from the menu of this café. 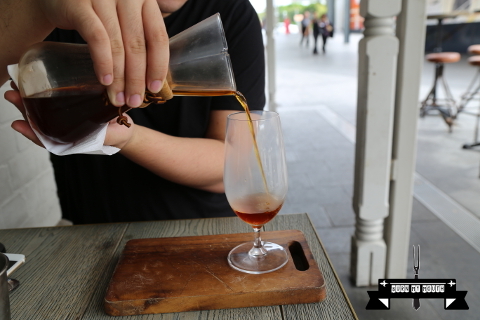 The chemex ($5) was a rich flavoured coffee, which has been infused for a longer time, to achieve a smooth consistency. It was served in a really nice glass flask, which looked like a wine decanter. The taste was elegant. Everybody loves Ramen ($19) consisted of bacon and egg noodles with a 63 degrees egg, speck, shitake mushroom, bacon dashi and shallots. 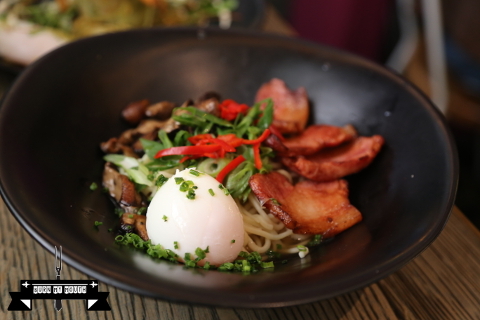 This dish had a distinctive Asian style to it with an element of Western fusion with the use of bacon and speck. The broth was very flavoursome but was not too strong as to overpower the other flavours of the dish. The amount of broth was also adjustable as you had to pour it yourself. The noodles, however, was a bit too soft. This was the perfect breakfast on a cold winter’s morning. Trout Pout ($22) came as a stack with smoked trout fillet, potato, leek and fennel cake, grilled fennel, horseradish cream, sorrel and a 63 degrees egg. The egg fell off to the side as the wait staff served the dish to us. 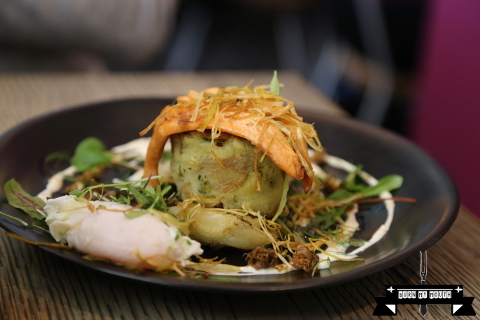 There was a mirage of flavours with this dish, with nicely infused Eastern and Western styles. The trout was nicely seasoned and not overcooked. This is a dish that is worth trying. Overall, we really like what Cuckoo Callay is trying to achieve with its menu, with inventive fusion breakfast food items that are different from the other cafes in the area. A must try if you are in the area.